Custom Germanium Lenses. 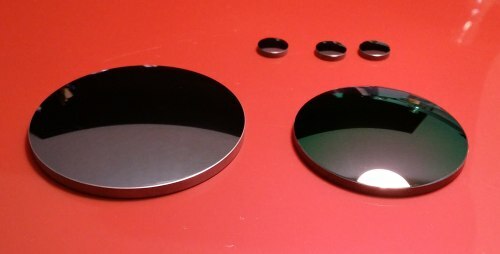 Germanium plano-convex lenses. Alkor Technologies - manufacturer of Germanium Lenses for Thermal Imaging, Pyrometry, Spectroscopy. Contact our Sales Team and we will try to offer best price on Germanium lenses. If you do not see a suitable size or focal length, write a request, we will make a lens according to your specifications at no additional cost. Hemispherical Germanium lenses available. Ge lenses with yellow mark are available on stock and can be shipped within 1-2 weeks. Ask now. Custom Germanium Lenses for Thermal Imaging Cameras, Infrared spectroscopy and Remote Sensing are available in any size and configuration at very competitive price. Anti-reflection coatings can be applied on Germanium lenses for 2-14µm and 8-14µm depending on your custom application. Germanium (Ge) plano-convex Lenses are ideal for use in Mid-Wave Infrared (MWIR) and Long-Wave Infrared (LWIR) applications. Additionally, Germanium’s Knoop Hardness of 780 is well suited for rugged environments. Due to thermal runaway, or the decrease in transmission as temperature increases, Germanium (GE) Lenses should be used at temperatures below 100°C.